Last year on July 2, poet Treasure Williams posted a short message in the note section of her facebook page: "i'm writing 40 kwansabas for fannie lou hamer. wish my writing hand strength!" Her note was followed by a short poem. And so began a still developing project that raises possibilities about verse, technology, and the ways poets present research. A kwansaba, the poetic form Treasure uses for the project, is a seven-line poem with seven words in each line with each of those words containing no more than seven letters. Proper nouns and some terms for different languages are exceptions to the seven-letter rule. Eugene B. Redmond, along with fellow poets in the Eugene B. Redmond Writers Club, created the kwansaba poetic form in 1995. Kwansabas have been published here and there since 1995, and appeared more and more frequently in the literary magazine Drumvoices Revue in recent years. Treasure's ambitious project might be extending the notion of a kwansaba and, more important, what it means to be a poet willing to share drafts of writings on facebook and through other social media . But let's start with her poems. Unlike many of the other kwansabas that I've read, Treasure utilizes the mode of persona. Her first kwansaba in her series is written from the first-person perspective of Hamer's mother, who had "birthd twenty field hands." 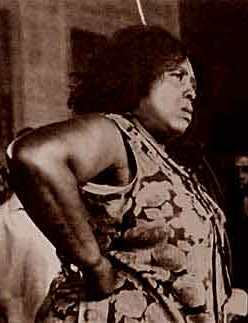 Fannie Lou Hamer was the youngest of her 19 siblings. The majority of the other kwansabas (Treasure is up to 29 poems so far) are written from the first person perspective of Fannie Lou Hamer. Hamer was born in Mississippi in 1917, and like her other family members and black folks in her part of the state in general, she became a sharecropper at an early age. In the early 1950s, Hamer became involved in the series of meetings and activities that would pick up steam and eventually become known as the modern Civil Rights Movement. She increased her levels of consciousness and participation over the years and became an important figure in the movement. She died in 1977 but has remained an endearing cultural figure. Just as Treasure has familial ties to the founder of the kwansaba poetic form, she shares geographic and cultural kinships with Fannie Lou Hamer. Treasure was raised in Mississippi and immersed in or at least acquainted with many black folk expressive forms such as storytelling, gospel, and blues familiar to Hamer and African Americans in Mississippi for years, decades. So far, Treasure's poems present various scenes and thoughts throughout Hamer's life. The poems provide readers (Treasure's facebook friends) with first-hand accounts almost exclusively from Hamer. We witness Hamer vis-à-vis Treasure chronicling her experiences living in poor conditions, being beaten while in jail, and thinking about larger racial injustices and violence committed against African Americans. Treasure regularly represents the southern African American Vernacular English (AAVE) of her main speaker. For example, the poem "redish'" closes with the line "gon’ redish today. we gon’ redish today." The "gon'" represents "going to," and the "redish" is "register." The use of this form of AAEV in the poems gives Hamer's voice a more distinctive feel throughout the series. It's possible, too, that the shortened words sometimes allow Treasure to adjust a formally longer term into the requirements of the kwansaba rule of using words with 7 or less letters. The speaker in her poem "jericho" mentions participating with activists in a march that could "bring a white house tumbln down." The word "tumbling" would have exceeded the word-limit, but "tumbln" works fine. 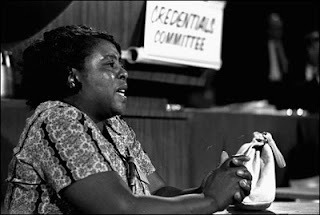 The appearance of Treasure's Fannie Lou Hamer poems on facebook gives us some new ways to think about the circulation and reception of poems. After the publication of the poems, Treasure's facebook friends can express that they "like" the pieces and provide comments. A number of poets, including Jericho Brown, Evie Shockley, Adrian Matejka, and Tara Betts, to name a few, have left admiring comments about the poems and encouraged Treasure to keep going. Tara Betts, who's written and published several kwansabas as well over the years, has been an especially active follower of Treasure's project. She has been the most frequent commenter on the poems, offering supportive feedback and questions. Some of Betts's clarifying questions lead Treasure to respond, which ends up benefiting the broader readership (I imagine more readers would benefit from a Tara Betts posing questions to poets here and there about their work and allowing us to listen in on the responses). In the comments after Treasure's poem "he’s a lawyer," Tara wondered if the "we" in the poem referred to Hamer or the lawyer. Treasure responded "girl, thanks for the feedback. actually, 'he's a lawyer'" is a reference to a common refrain in southern sermons: 'he's a lawyer in a courtroom, he's doctor in a sickroom . . '"
Treasure continued noting that the poems she's posting on facebook "are real first drafts, chile:) i probably need to come up with another title. on a related note, i read june jordan kid's bio of fannie lou today. good stuff. found out about a farming co-op she founded. bout to research and see if it still exists . . ."
I took note of Treasure's big-sister familial phrasings to Tara (i.e. girl and chile); her reference to June Jordan's biography for young people, Fannie Lou Hamer (1972); and her mention of researching to find out more information. Ok, ok, you get my point. When Treasure goes through and produces final versions of the kwansabas, it's possible, as she suggested in the comment to Tara, that the poem "he's a lawyer" will appear under a different title. So what's important right now, especially as it relates to the composition/publishing history of this poem, is that as Treasure was writing "real first drafts," her mind was considering ways of incorporating black sermonic traditions into the piece. The draft of the poem and response to Tara Betts provides an interesting and small window into the thinking processes of the poet. 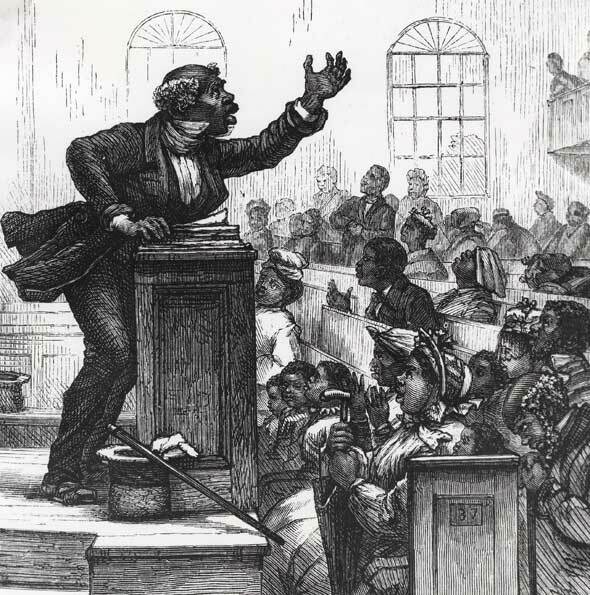 I guess that kind of incorporation of black verbal rhetorical traditions is no surprise though. Treasure is a talented artist, who displays her skills through her performance of poems and her performance of songs. At some point, I imagine, Treasure's poems will start to appear in traditional print forms--magazines, anthologies, and books. Before then, there's evidence that the poems might circulate beyond facebook. Treasure Williams publishes "real first drafts" on facebook. When she posted her poem in the series "head start," one commenter asked "May I use this in my classroom...It's beautiful," Treasure thanked the commenter and responded "i am very interested in getting my poetry and the work of other poets into the classroom. use away, chile, use away!" So it's now possible that at least one of the Fannie Lou Hamer kwansabas has moved from Treasure's facebook site on to a classroom of students. The appearance of Treasure's kwansabas on facebook and the larger implications of the publication of new poems in general on social media sites by African American literary artists has me wondering even more about the question of what black writing will be. And how will the views and responses to Treasure's works on Hamer shift as the poems appear in different formats? I wonder how she'll sound performing the poems? I'm looking forward to the kinds of answers and questions that will emerge as Treasure completes the project. What Will Black Writing Be? i must say that this an extremely generous consideration of my work. you have made me consider much more deeply the way in which this medium of social networking has impacted my drafting process. it is a sort of remote workshop, where i receive asynchronous feedback. in fact the experience has proved so fruitful that i have enlarged the goal from a series of 40 kwansabas, to a book length series of 49. 49 is a number that resonates with 7's. 7X7=49, kwansabas are made of 7's (lines and words), and in the folklore of southern african american christianity, it is believed that "7 is god's favorite number". mrs. hamer would have heard that many times. thank you, prof., for your insightful gaze and your thoughtful writing.